Reuters/Mike Segar A man holds a sign at a tax day rally by Tea Party activists in New City, Rockland County, on April 15, 2010. 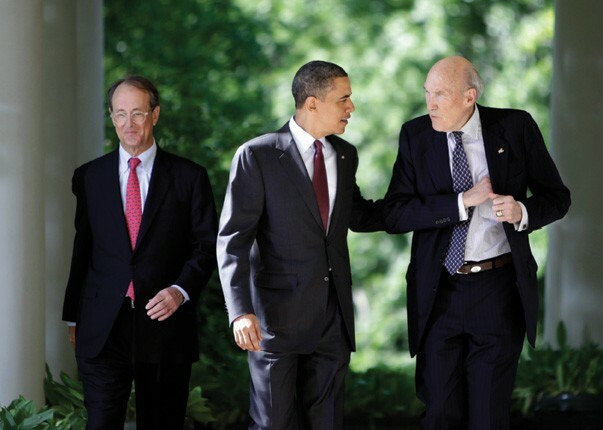 President Barack Obama speaks with former Republican Senator Alan Simpson (R) at the White House in Washington on April 27, 2010. Pictured on the left is former White House chief of staff Erskine Bowles. Simpson and Bowles were co-chairs of Obama’s fiscal commission, in charge of deficit reduction. "The reality is, we should be doing something to boost the economy," says Center for Economic and Policy Research Co-chair Dean Baker. "Near-term focusing on the deficit is next to crazy." 2. In the next few years, the paramount fiscal policy goal should be stimulating growth and job creation. That means, first of all, not scheduling any serious deficit-reduction plans before roughly 2015. The country needs faster job creation not only to reduce unemployment but also to push up wages. Faster job, wage, and GDP growth—whether stimulated by a 2011 Social Security tax holiday or new public investment—will also generate more revenue to reduce government deficits than an economy hamstrung by constricted public demand. Even if growth alone cannot solve future budget shortfalls, government spurs to long-term growth—including infrastructure investment, basic research, more education funding (especially early childhood), support for developing new "green" manufacturing, and rebalancing the global economy to reduce trade deficits—would be good in their own right. 3. There is no reason to cut Social Security and many reasons to expand it. As the BS plan states, Social Security does not—and by law cannot—contribute to the deficit. By current projections, it can pay full benefits until 2037, and collecting Social Security taxes on all income—from earnings and capital—would make the system solvent for many more decades. Yet many deficit proposals (BS, RD) target Social Security, cutting payments by changing the cost-of-living formula and raising the qualifying age. But as both income inequality and people's risk of sudden changes in income increase, and as reliable defined-benefit private pension plans vanish (except for executives like Erskine Bowles), the government needs to increase the payout to retirees, not to privatize Social Security as many Republicans still want. 4. Beware proposals that use deficits to mask attacks on government, the welfare state, public employees, or Keynesian policies. President Franklin Roosevelt, expanding on his New Deal achievements, called for a Second Bill of Rights—rights to a useful and remunerative job, adequate income, a decent home, medical care, a good education, and protection from economic hardships of old age and sickness. "True individual freedom cannot exist without economic security and independence," he argued. But Rep. Ryan (PR), the Wisconsin Tea Partier, sees in such policies a "culture of dependency" on a government with an "unsustainably rapid rate of spending growth" that threatens to "smother the economy" and corrode our "national character." The proposed austerity budgets are more Ryan than Roosevelt, seeking to cut government, not secure a "second bill of rights." For example, some propose shrinking and limiting federal spending to 21 percent (BS) or 23 percent (RD) of GDP, a goal that has nothing to do with reducing deficits and everything to do with arbitrarily limiting government. Currently, the United States taxes and spends less as a share of GDP than all but two other developed countries, Turkey and Mexico. Taxes account for more than 40 percent of GDP in eight developed countries with thriving economies and high standards of living, but combined taxes from all levels of government in the United States account for only 26.2 percent of GDP, according to data from the Organisation for Economic Co-operation and Development. 5. Focus solutions on the real problem: healthcare costs. According to the Center on Budget and Policy Priorities, the vast majority of the projected deficit through 2020 comes from, in this order, the Bush tax cuts, the economic downturn, the Iraq and Afghan wars, and the Obama stimulus programs. Many of the deficit plans include some military cuts, but none propose a major shift on current wars. Looked at from another perspective, rising health care costs—both in the general market and in public programs—drive virtually all the rising deficits. But other rich countries spend less with better results and lower projected increases. Some plans (BS, RD) shift many costs to workers, also increasing medical and financial risk to recipients. (RD and PR favor vouchers for buying private insurance to replace Medicare, an option raised by BS.) But moving toward a public, single-payer plan—or at least a public option—could bring health care costs more in line with those in peer countries, control the deficit, and better protect average citizens' health and financial well-being.